In The Art of Bellydance, Suhaila presents an essential compilation of bellydance favourites from the most renowned musicians in the Middle East. 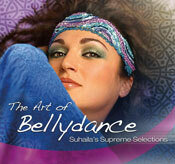 Suhaila Salimpour is the world's most acclaimed teacher, choreographer and performer of belly dance. In The Art of Bellydance, Suhaila presents an essential compilation of bellydance favourites from the most renowned musicians in the Middle East.